The GPIO4 peripheral gives you direct control of four FPGA pins. The pins can be individually configured as inputs or output, and inputs can be configured to send an update when the input value changes. 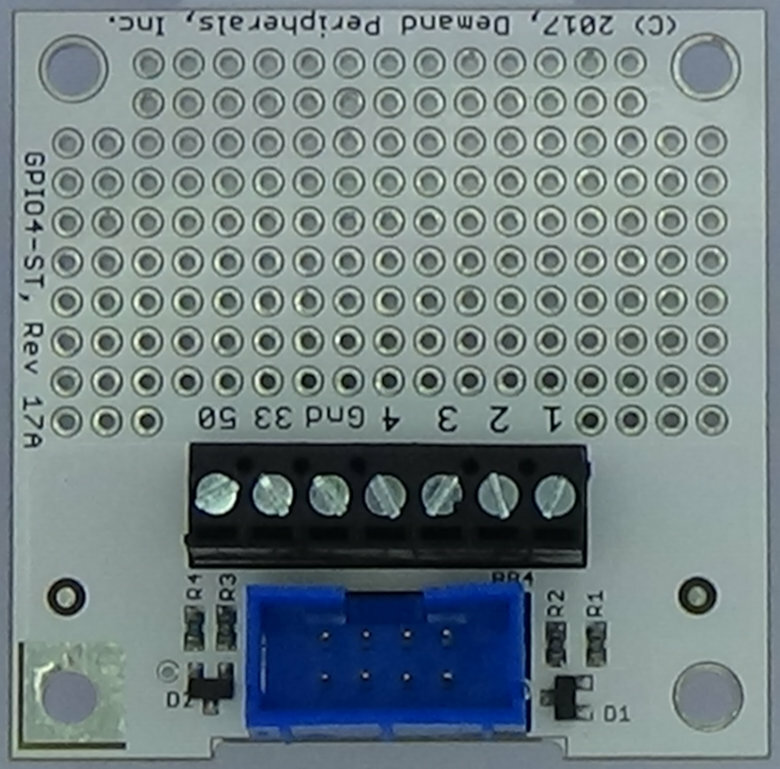 The gpio4 cards give direct access to each of the four pins in a Baseboard slot. Each GPIO pin can be an input or an output, and changes at an input pin can trigger the sending of the pin status up to the host. The highest numbered pin on the connector is controlled by the LSB in the control and data registers. More information about the GPIO4 cards is available here cards/gpio4.html. pins : the value on the GPIO pins. 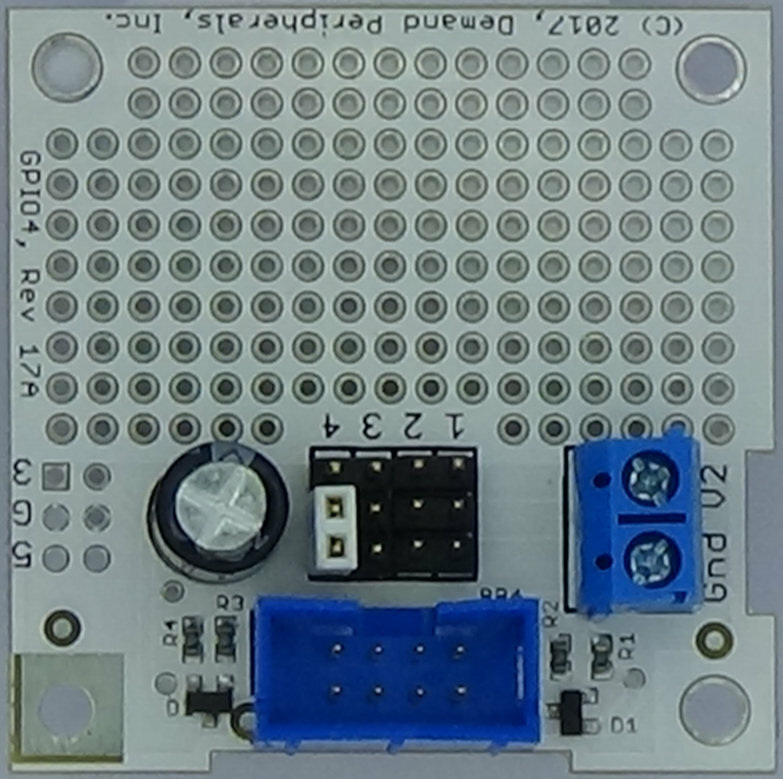 A write to this resource sets an output pin, and a read from it returns the current value on the pins. A read requires a round trip over the USB-serial link and may take a few milliseconds. Data is given as a hexadecimal number. You can monitor the pins using a dpcat command. Using dpcat only makes sense if one or more of the pins are configured as input and as a source of interrupts. as a hexadecimal digit. A set bit makes the pin an output and a cleared bit makes it an input. The power up default is for all pins to be inputs. This resource works with dpget and dpset. interrupt : an 'interrupt' enable mask. When a pin is an input and the interrupt bit is set for that pin, then when the logic level of the pin changes, the FPGA builds and sends a packet with the new value of the pins. This ability is called 'interrupt' since it is asynchronous and not polled. The interrupt resource works with dpget and dpset. Set pins 3 and 4 to outputs and pins 1 and 2 to input with interrupt-on-change enabled for both. Use dpcat to watch for changes at the inputs.